Someone I know is taking a two year sabbatical so I wanted to give her something to wish her good luck. She's always commented on my knitting -- I even knitted her a pair of Mac and Me yoga socks a few years ago. I wanted a scarf that would be soft like a big hug, something that she could wear indoors as well as outdoors. 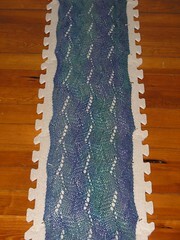 The answer was a Stepping Stones scarf. I finished it way ahead of the deadline: it only took me two weeks. The pattern (by Jane) was easy to memorize and the yarn (Ixchel by Spirit Trail) produced a nice and colorful "meandering". I hope the recipient likes it! Notice the nifty blocking contraption? I was getting tired of using the guest bed and wet towels every time something required blocking so when I saw the Knitter's Block at a LYS, I splurged.